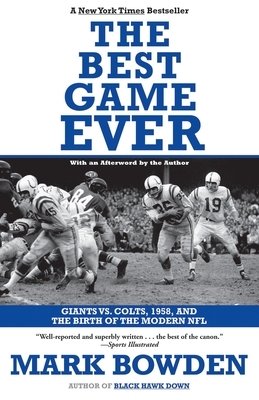 On December 28, 1958, the New York Giants and Baltimore Colts met under the lights of Yankee Stadium for the NFL Championship game. Played in front of sixty-four thousand fans and millions of television viewers around the country, the game would be remembered as the greatest in football history. On the field and roaming the sidelines were seventeen future Hall of Famers, including Colts stars Johnny Unitas, Raymond Berry, and Gino Marchetti, and Giants greats Frank Gifford, Sam Huff, and assistant coaches Vince Lombardi and Tom Landry. An estimated forty-five million viewers—at that time the largest crowd to have ever watched a football game—tuned in to see what would become the first sudden-death contest in NFL history. It was a battle of the league's best offense—the Colts—versus its best defense—the Giants. And it was a contest between the blue-collar Baltimore team versus the glamour boys of the Giants squad. The Best Game Ever is a brilliant portrait of how a single game changed the history of American sport. Published to coincide with the fiftieth anniversary of the championship, it is destined to be a sports classic.